WEATHER; Cloudy first thing after more rain, much brighter in the afternoon, a cold breeze all day. This was our last full day in the desert region so we made the most of it, we had a fabulous day searching out some of the most sought-after regional specialities, we went for quality not quantity and it paid off handsomely. 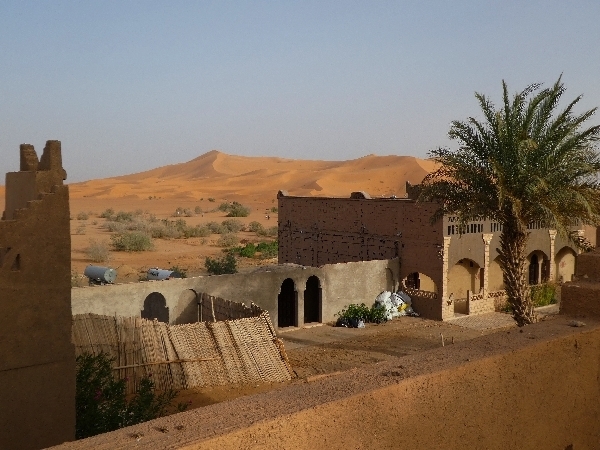 After a lovely breakfast we set off into the vast, flat desert region around the Erg Chebbi Dunes, it was quite cold first thing but we soon got used to it. 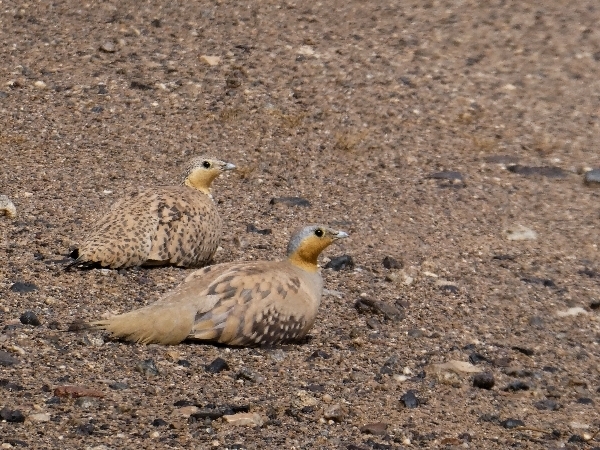 We drove straight to an area where a huge flat, stony, plain that had very little vegetation and ahead of us was a group of Sandgrouse sitting on the stones. 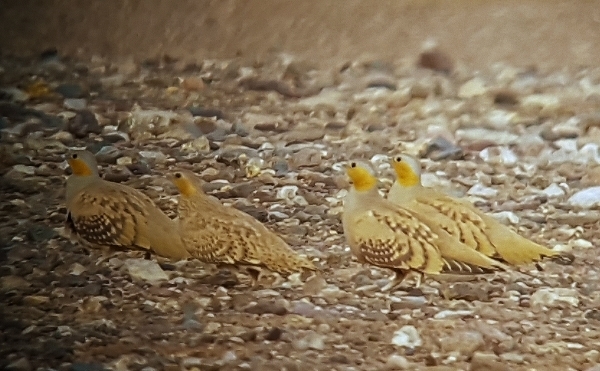 Over the next half an hour we scoped the Sandgrouse, there were about 30 in that first group but soon we noticed a second group and all the time we were there small groups were coming and going. Unfortunately for us they were all Spotted Sandgrouse and not the Crowned we were hoping for. We continued our search noting many other birds too, lots of Hoopoe Larks, small flocks of Greater Short-toed Larks, various Wheatears, Brown-necked Ravens, Common Kestrel and a Marsh Harrier. 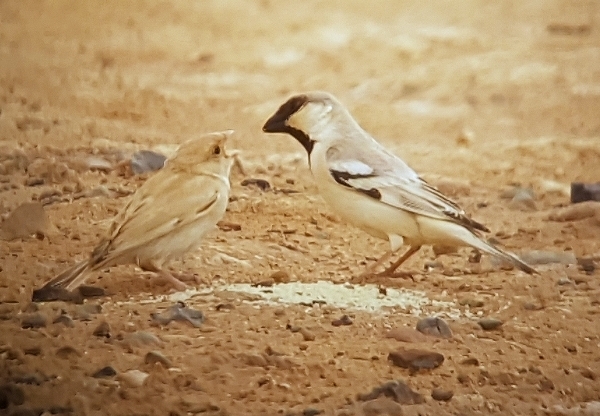 Next we drove to a small group of dwellings which was a known site for breeding Desert Sparrows and within minutes we saw a female feeding two fledglings, marvellous! It was a while before a male turned up and when one did we saw a second one too. 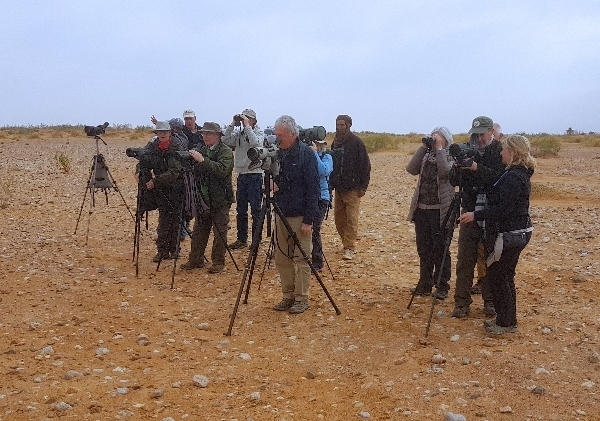 We watched them for quite a while and in the meantime we found a Sebohm's Wheatear and a Bar-tailed Lark which was still on the wanted list for some of the group. For the next hour we searched more areas of the desert for elusive Crowned Sandgrouse without success, so we concentrated on another regional speciality, the EGYPTIAN NIGHTJAR. 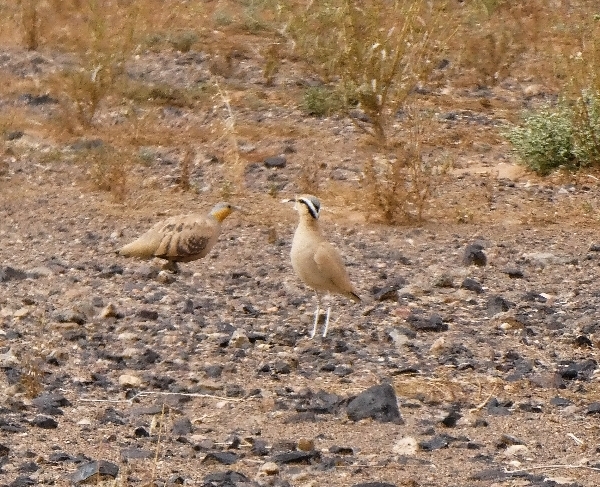 We drove to a wadi where a local Berber herdsman was waiting for us, he lead us to a place and pointed out a NIGHTJAR that was roosting on the ground, wow, just like that, there was the bird. 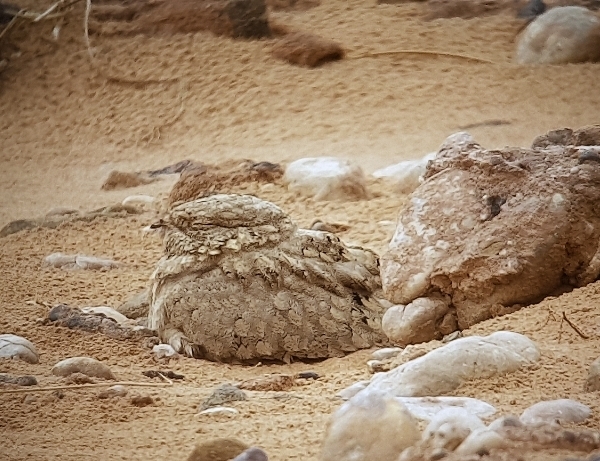 Egyptian Nightjar, can you see it? A little later he called us over to another place not far off and pointed out a second bird, it was amazing how he was finding these birds because they are so well camouflaged they blend in so beautifully with their surroundings. 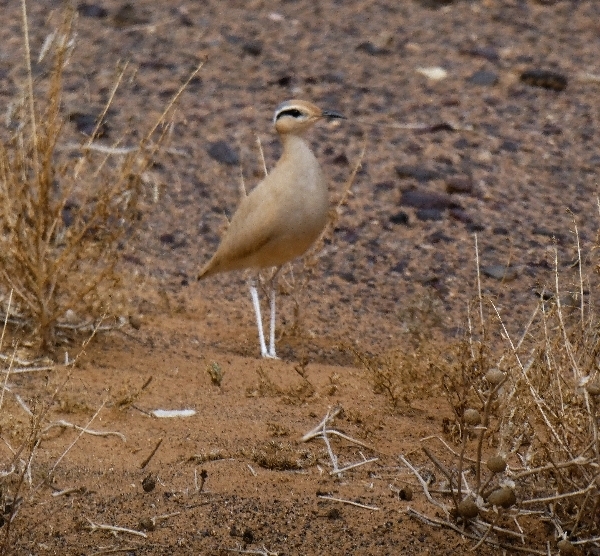 Back in the 4x4 vehicles we continued our search for Sandgrouse and towards midday we came across several small pockets of Spotted Sandgrouse and several small groups of Cream Coloured Coursers, in fact we found both birds together at one stage! It was 1pm when we returned to Auberge Cafe Yasmina for lunch, we spent an hour there before setting off for a second visit to the lake at Merzouga. Some birds were seen around the Auberge including Woodchat Shrike, Subalpine Warbler, Bonelli’s Warbler and two Laughing Doves. At the lake we had Avery difficult time trying to negotiate the muddy tracks around to the west side where we hoped for good close views of the ducks we missed yesterday, namely, Marbled Duck, Blue-winged Teal and Garganey. After a lot of walking we seemed to have not got any closer, there were many inlets to walk around and headlands in the way, it was a frustrating time. Eventually we arrived at a muddy outcrop where we could scope the area where the ducks were feeding. We listed dozens of Northern Shoveler, hundreds of Eurasian Coots, a few Northern Pintail, a pair of Gadwall, 4 Ferruginous Ducks and even further away we saw the Marbled Ducks. One or two of the group picked out a Garganey and a single Eurasian Teal but not the Blue-winged variety. After more walking we gave up trying to get close to these birds, we did find a large group of White Storks, about 70 of them, we also found a Saharan Olivaceous Warbler, more Subalpine Warblers and several Yellow Wagtails. It was 5pm when we left and almost 6pm when we arrived back at the Auberge, there was a lot of excitement around the bird ringers when some of bus went on the main terrace for some last minute birding. A Barbary Falcon had just been seen and a while it reappeared for us to see, smashing, a great bird to finish off a great day. Later more of the group were able to see this bird through the scope perched on a pylon eating a ‘catch’. We ate again at 7:30 and after we called the bird-log, we have now seen 145 species, tomorrow we head off towards to the coast, we have our longest day on the road ahead of us.